At home bachelorette parties can be a lot of fun like this one. 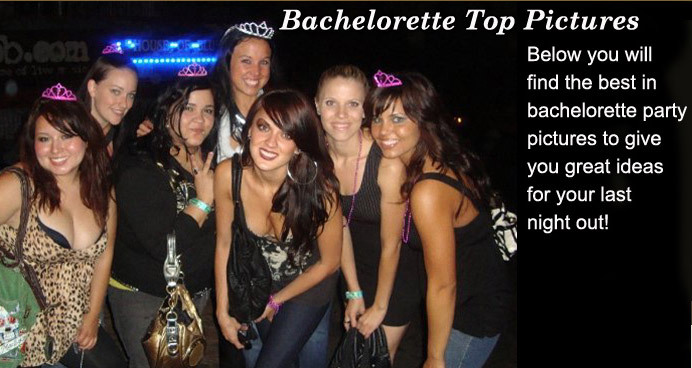 Notice that the bachelorette is in the front wearing a bachelorette sash which is an excellent item! The girls are all together, smiling and having fun! We love this bachelorette party picture! These girls are in a great bachelorette party theme of all wearing black and the bride-to-be in white with a bachelorette party boa. The only issues we have is that the photographer did not center the picture and got too much of the ceiling. Still a cute bachelorette party picture and group of bridesmaids. A cute group of bachelorettes with the bride-to-be in a pink tank top as well as the bridesmaids in black customized bachelorette party shirts! Notice that there is not a lot of light which is important in a good picture. The backdrop is also a little cluttered but still a cute picture. Whoops. A cute bachelorette party group of girls with cute customized shirts, mardi gras beaded out and the bride in the middle with her sash and tiara but they are all looking at another camera! Make sure to only have one camera at a time and everyone's undivided attention if you are taking a staged bachelorette party picture! Wow. 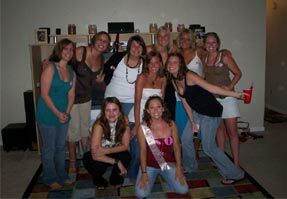 A lot of bachelorette party goers in this cute bachelorette party picture. At home bachelorette parties usually warrant more girls going since they can afford a home bachelorette party in this economy and don't usually have to travel too far! A great bachelorette party picture although we don't know who the bride-to-be is but do see the bachelorette party banner in the background. A cute bachelorette party picture of some of the girls at the bachelorette party with the bride-to-be. Cute that she is wearing pink while the other girls are wearing black. 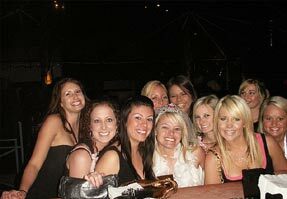 Take some bachelorette party pictures with a few girls at a time, besides only group shots as they are great to have as memories and are usually more close up. You can also give these pictures out in bachelorette party frames to the maid of honor or your friends. We hope these pictures give you some ideas on how to take your own pictures at your bachelorette parties! 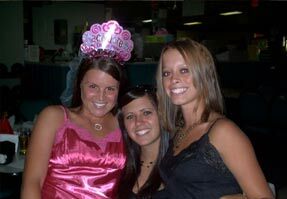 Send your pictures in for us to place up at bachelorette@bacheloretteparties101.com.